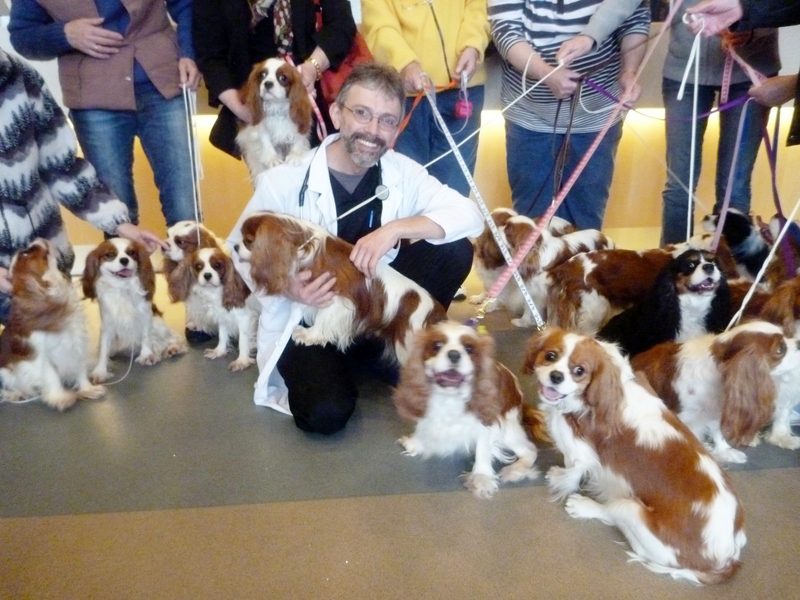 Recently, Canada West Cardiologist Dr. Marco Margiocco and teamed up with Bertie Nelson of the Cavalier Club of BC to preside over a heart-check clinic day (the technical term is an “auscultation clinic”) for a large and happy group of Cavalier King Charles Spaniels (“CKCS”). Mitral valve disease is the most common form of heart disease in CKCS dogs. Mitral valve disease is highly heritable (i.e. passed from one generation to the next) and a study published in 2010 provided a simple protocol for breeders to help breed healthier dogs by avoiding breeding of CKCS dogs that show signs of the disease during their first five years of life. With the information gleaned from such clinics, breeders are in a better position to improve the health of future generations of puppies. If you would like to learn more about organizing a heart-check clinic for your dog club, please contact the cardiology service at Canada West.